Over the last year, as part of our Fiberygoodness activity, we have released a range of ‘Yarn Recipe Cards’. These are simplified instruction cards for spinning different kinds of yarns, completed with step by step photos. The first was a set of 12, mostly yarn designs I have worked on and developed over the last couple of years. The second set was an collaboration between Arlene (Spin Artiste) and I, and it was prompted by the words of the late Maya Angelou, an amazing woman with some astounding insights. This was Arlenes suggestion and challenge 🙂 And I say challenge because it often is just that, taking words, or some kind of abstract concept, and turning that into a tangible and solid form, in this case yarn. 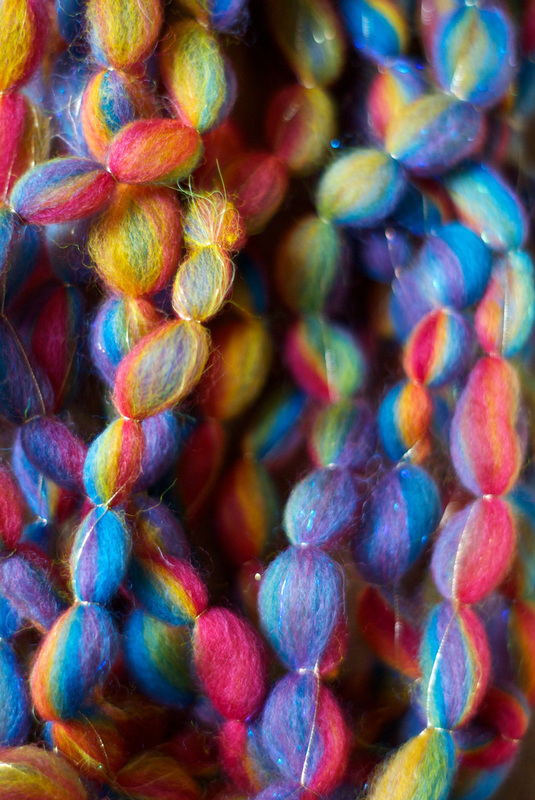 To me this is what makes a yarn ‘art’ – the layer of concept and abstraction that has caused it to be created at all! This is exciting to me and I love the thought exercise it gives me as well. Arlene is especially good at selecting these challenges! We chose three quotes each to work on. Today I want to share with you the motivation and explanation of one of the three yarns I came up with, it is my no twist single: ‘Brave”. This is why. And suddenly we see that love costs all we are and will ever be. Yet it is only love that sets us free. I adore these words. To me these words describe unconditional love, simple but complicated, daring and full of risk, and yet it leads to ultimate freedom. Love challenges us to take chances, to be brave, it takes everything we are and we give that freely, and that act itself returns our freedom to us, in my mind it is all about letting go, and acceptance, and the consequence is the removal of fear. How to express that in yarn? wow! Its so BIG! Along with the recipe cards, Arlene and I both did a short write up about each yarn design and how we related the words to the fiber. I would like to share with you what I wrote about this yarn, and Maya’s words. I hope it gives you some ideas for your own creations and another way to form a bridge between concept and concrete in your fiber work. I really connected with the notion of love requiring bravery, also that it offers us the chance to BE brave and even pushes us into taking risks. This prompted my idea for creating a very very low twist yarn, in fact this yarn has almost no twist at all, when the definition of spinning is really.. adding twist to fiber. Is this then what it costs me? Letting go of that fundamental principle that has pushed my spinning, so far, to extreme plying? 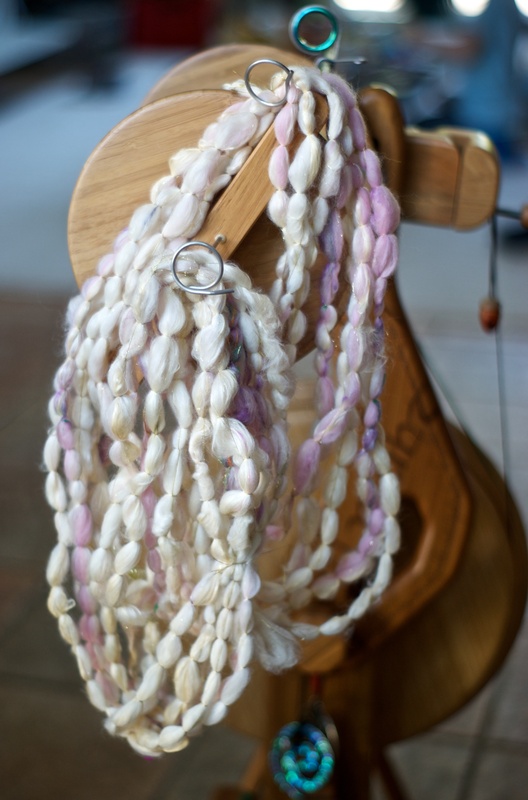 When I think about my loves light being my passion for fiber, and the places that has taken me, this leads to the gold shiny thread that is holding this yarn together and even makes it possible. It’s unsubstantial, and yet its is what binds the fibers into their form, it provides strength, and without it the yarn would fall apart. Trusting in that, allowed me to spin this single with almost no twist at all, to create softness and openness as the yarn blooms outwards. A no twist single? This is where the freedom lies, when the impossible becomes possible, risking failure and finding that the world has changed from your original understanding of it, because you have been brave and ready to trust your passion. This is such a beautiful post! And what a gorgeous yarn!! I can’t even tell you how deeply moved I was reading Maya Angelou’s words and seeing your yarns Suzy–absolutely amazing the way you translated those words of love and courage into “yarn poetry” As a fiber artist I am always asking myself, “How can I express myself with these fibers?” “How can I translate this feeling or this idea into yarn, stitch or textile?” Thank you also Arlene for this very creative idea. I am so grateful to for sharing your words and your yarn with us–I feel inspired . It’s called “fiberygoodness” for a reason! You just have to keep showing me this yarn….when we get to the big hill in TDF this will be my Brave challenge. I take deep breaths and for me, I am never hesitant, I jump in and do stuff, but this technique makes me pause. Maybe it is because I am reading it and not seeing it. I will do this. I will be Brave!